Non-small-cell lung cancer (NSCLC) cells with somatic mutations in epidermal growth factor receptors (EGFR) are initially susceptible to tyrosine kinase inhibitor (TKI); however, eventually resistance to TKI is developed in these cells, which leads to the failure of treatment. The most common mechanism of this acquired drug resistance is development of a secondary T790M mutation in EGFR. 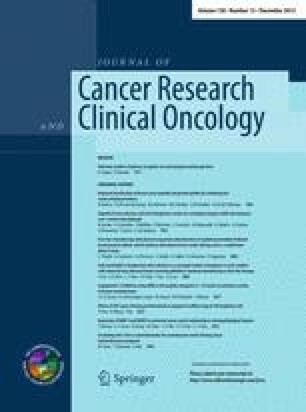 In this study, we investigated the effects of the combination of Erlotinib and Cetuximab on T790M and L858R mutation lung cancer cells lines (H1975), in the primary NSCLC cells with the T790M mutation and TKI-resistant EGFR mutations human tumor xenograft model (H1975). The effects of these two agents on cell proliferation, apoptosis, and EGFR-dependent signaling were evaluated using 3-(4,5-dimethylthiazol-2-yl)-2,5-diphenyltetrazolium bromide (MTT) assay, annexin V staining, and Western blotting. Sensitivity of EGFR inhibitors was detected in the primary tumor cell suspension and human tumor xenograft model (H1975). Compared with single-agent treatment, the combination of Cetuximab and Erlotinib increased apoptosis of EGFR TKI–resistant NSCLC cells (H1975), resulting in more pronounced growth inhibition on cell proliferation and significant inhibition of EGFR-dependent signaling. These data suggest that treatment with a combination of Erlotinib and Cetuximab overcomes T790M-mediated drug resistance. Meng Wang and Jing Zhao are equal contributors to this paper. We would like to thank Dr. Hong Yang and Rex Hadley for helping in editing this manuscript. We thank the Department of Immunology, Cancer Hospital of Tianjin Medical University for all technical assistance for the project. This study was supported by funding from the Science Foundations of Tianjin Medical University (2008ky21) and Tianjin Medical University Cancer Hospital (0906).